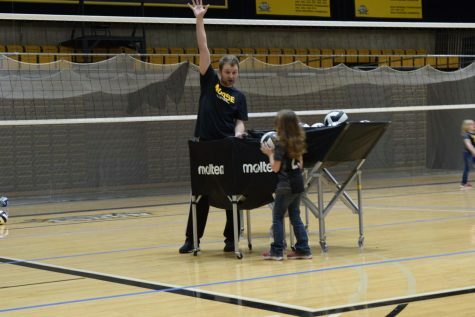 After over 45 minutes of helping the Northern Kentucky volleyball team with their practice, which included assisting team managers with drills and collecting volleyballs, Leah Conrad ambled back toward her mother, Jenka, who was seated by the scorers table on the sidelines. Leah and Taylor signed letters of intent for the NKU volleyball team on Monday afternoon through Team IMPACT’s “Draft Day” ceremony, an organization where serious or chronically ill children connect with college athletic programs. Taylor and Leah both are diagnosed with epilepsy, a condition that causes seizures. In addition, Taylor is diagnosed with Ehlers-Danlos syndrome, a condition that causes joints and tissue to stretch further than average. As they sported volleyball jerseys with their first names printed on the back and signed letters, family friends, members of the athletic department and the entire volleyball team looked on. 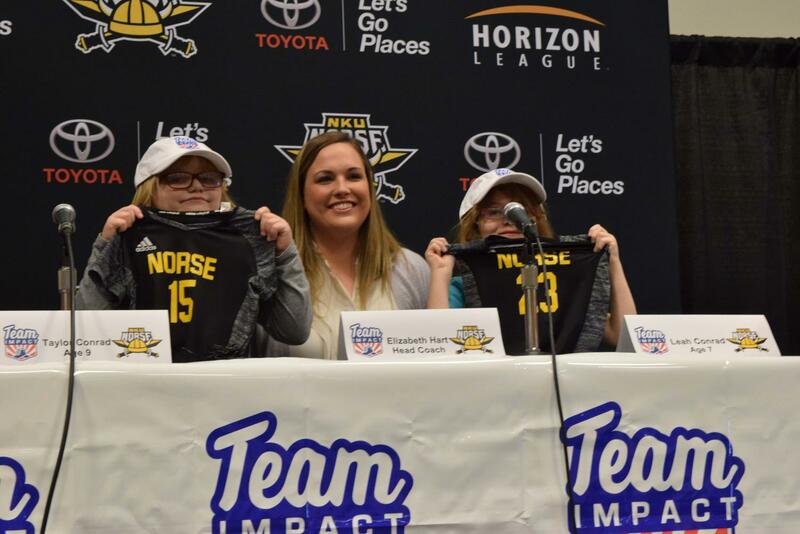 Jenka joined her two daughters on the podium with NKU head coach Liz Hart. 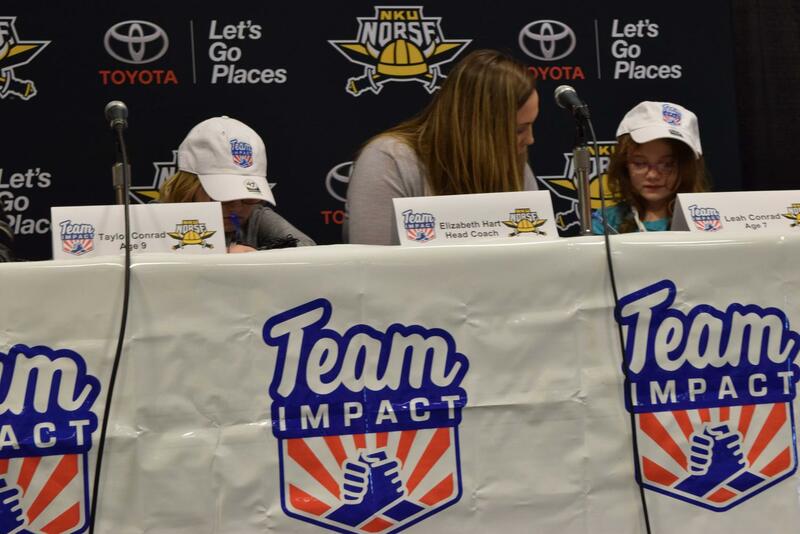 The two sisters were signed up for Team IMPACT by their mother, Jenka, in hopes that it would give them a larger support system–one that felt like a family. Based on their reactions after the press conference, those hopes have become reality. Her favorite part? Being on the team. “They are sort of like my family,” she said. In October 2014, Leah was diagnosed with epilepsy after her mother noticed her zoning out while the rest of the family was cutting wood outside of their Florence, KY home. Jenka took her youngest daughter to Children’s Hospital; after three days of MRI’s, EEG’s and other tests, the doctors discovered Leah suffered from absence seizures. Doctors told Jenka that Leah had an extra brainwave, which could make for a more progressive form of epilepsy later on. “We’ve never had a week and a half seizure-free since the beginning of all of this,” Jenka said. A bad day for Leah starts with a rough night: night episodes make getting out of bed bed in the morning difficult, and throughout the day she could have anywhere from one to 10 more seizures. Over Independence Day weekend, Leah suffered over 40 absence seizures and three or four grand mal seizures, which involve loss of consciousness and muscle contractions. After going through what Jenka calls a “laundry list” of seizure medication, Leah currently takes three different seizure medications and has about one seizure every week. Leah also has a service dog, a golden retriever named Ramsey, who alerts Jenka to a possible seizure an hour before it occurs. Ramsey can also detect Taylor’s seizures, who was diagnosed in January of 2016, but not as quickly. A week after diagnosis, Jenka noticed purple marks on Taylor’s skin and thought they were from a purple marker. “I tried to scrub those said purple marker dots off and they weren’t coming off,” Jenka said. Taylor spent two nights on the Cancer and Blood Institute at Children’s Hospital, which Jenka calls the scariest hospital stay of her life. Doctors discovered her oldest daughter had idiopathic thrombocytopenic purpura, a condition where her immune system mistakenly attacks platelets instead of an infection. Taylor’s platelet level went down to zero, and she was at risk for internal bleeding and brain hemorrhaging. Jenka was convinced, for awhile, her child had leukemia. After a round of IVIG treatment, Taylor went home, only to return home seven hours later after a severe reaction to the treatment. Her platelet levels began reaching somewhat normal levels a few months later. But, Taylor’s joints moved abnormally, which , prompted the Ehlers-Danlos syndrome diagnosis. Because of this, the Conrad’s have to be mindful of how Taylor uses her body, going as far to make sure her knees don’t lock as she’s standing, which would cause hyperextension. Taylor can only perform 15 minutes of exercise before needing rest so she doesn’t wear out her joints. Both girls’ seizure types have changed since diagnosis. Taylor’s seizures have morphed from absence seizure into grand mal seizures. “The first day she had a grand mal seizure… the point we had timed it, it was four and a half minutes but it had been going on for at least two minutes before we realized what was going on,” Jenka said. “She could have a drop (atonic) seizure today, a focal seizure tomorrow and maybe a grand mal two days from now,” Jenka said. Doctors fear this could happen to Taylor soon. Despite the physical limitations, Taylor and Leah enjoy playing sports. The family enjoys playing backyard volleyball at home during the summer and will play volleyball in the pool until dark. The water doesn’t put as much stress on Taylor’s joints. The Conrads first visited the volleyball team in September during a match. Jenka said Taylor, who is the quieter and more reserved of the two, wasn’t sure about the idea of meeting the team. Leah, however, was ecstatic. She danced with the cheerleaders and by the end of the night, she was asking Jenka when she could go back. “She asked, ‘When can I go to practice with my team?’” Jenka said. Taylor warmed up to the idea; soon, the family headed to NKU volleyball practice to meet the team. Junior Haley Libs met Taylor and Leah in the locker room before practice. From there, the sisters went to several practices before the end of the regular season to get familiar with Hart and her players. 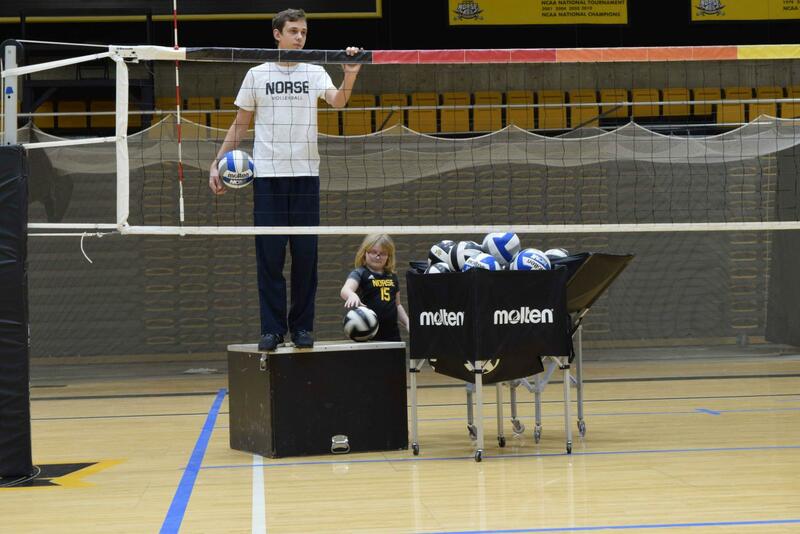 While the girls aren’t active participants in Norse volleyball practices, they keep busy with various tasks like shagging and collecting balls after they are hit. Libs said, while the Norse can’t halt practice to help the Conrads, players will take the girls off to the side and practice the different types of volleyball hits. The team allows the duo to help write team goals on the whiteboard during practices. During Monday’s practice, they handed volleyballs to assistant coach Jason Ruppelt and graduate assistant Matt Kearns during spiking and digging drills, occasionally attempting a pass to the players or jumping in the air and tossing the ball to their respective coach. One of the biggest hurdles facing the Conrads is about to be crossed. Jenka’s husband, Kyle, is a few months away from retiring from the U.S. Navy. Kyle is currently stationed in Norfolk, VA and has been gone for long periods of time in the past. Over New Year’s, Kyle witnessed one of Taylor’s grand mal seizures for the first time. Even from a distance, Jenka says she still leans on him to keep her grounded and calm her down when things aren’t going well at home. Feelings of anger and sadness towards the disorder creep up in Jenka from time to time. Leah is a jokester and a ball of energy, according to Jenka, which helps lighten the mood around the house. Taylor is much more particular and reserved. Each have their own way of handling a stressful situation. The Conrads try to keep a positive attitude on a daily basis. 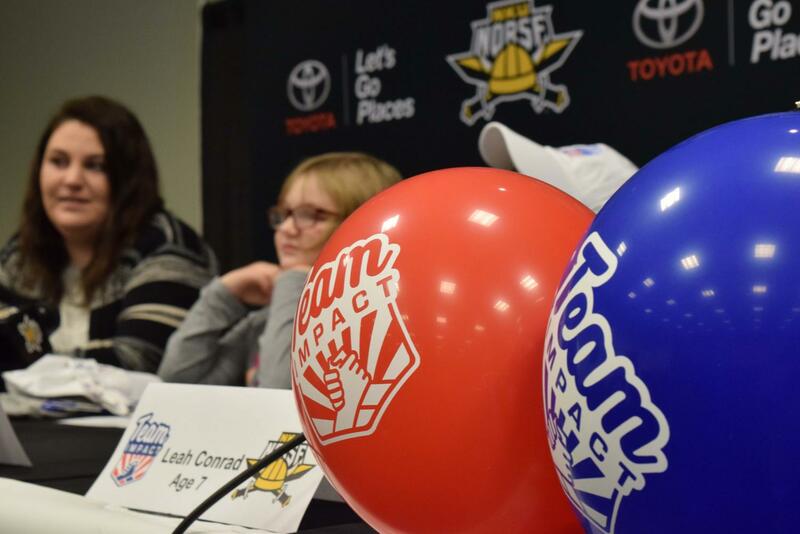 To learn more about Team IMPACT, Epilepsy, Ehler’s Danlos Syndrome or ITP, click on the links provided.